Eternal Sunday: 09/ 2015 Canal Pop: new music video for “Come To My World” premiered at Side Line! 09/ 2015 Canal Pop: new music video for “Come To My World” premiered at Side Line! 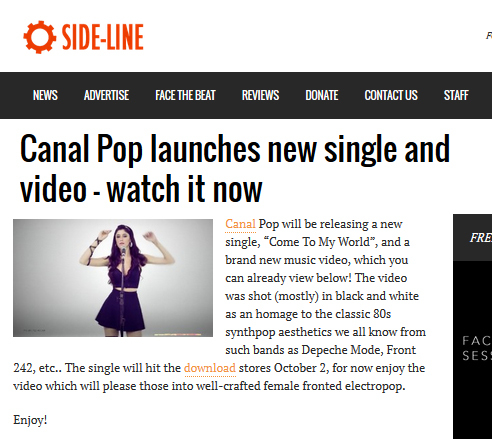 The nice people from the Belgian electro/ industrial magazine/ portal Side Line premiered the new Canal Pop feat. Josefina Aufranc music video for the upcoming single Come To My World. The music video was shot (mostly) in black and white as an homage to the classic 80s synthpop aesthetics used by from such bands as Depeche Mode or Front 242. The single will hit the download stores October 2, 2015.